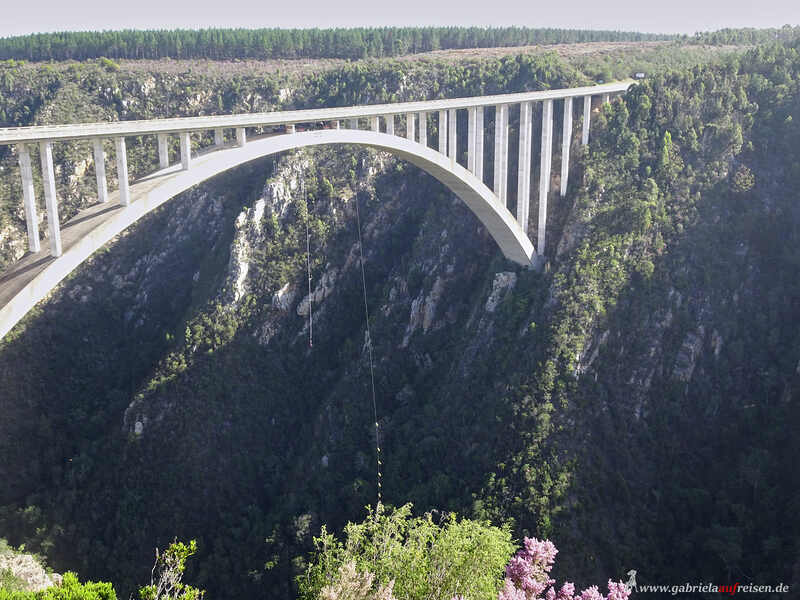 I am traveling through South Africa with my clients. 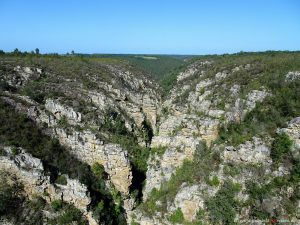 This blog post is about the Cape Region. Gebeco is our German tour operator with whom we travel. After we say goodbye to our wonderful bus driver Mavis in Johannesburg, we fly with our local guide Gisela to Port Elizabeth, to drive overland to Cape Town. 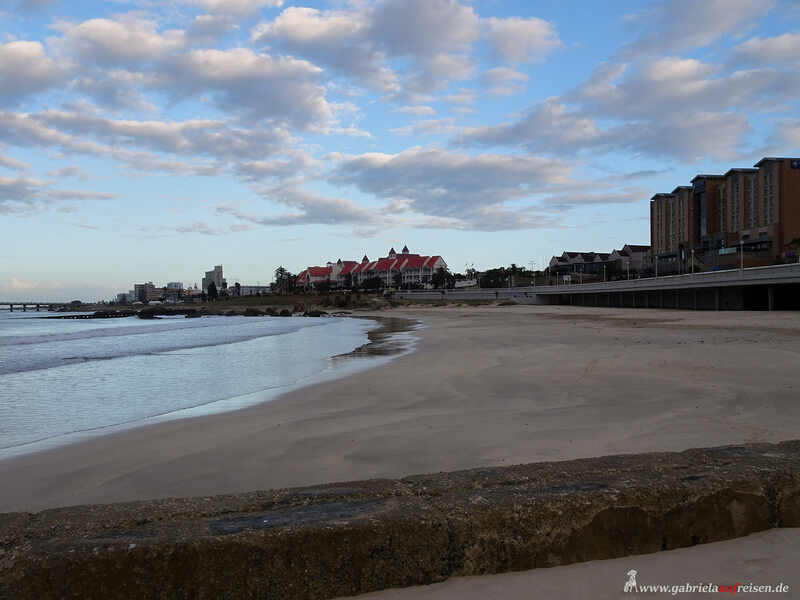 In Port Elizabeth, we arrive at late afternoon, so there is just time to take a walk to the beach, because the “The Kelway Hotel” is just a stone’s throw away. 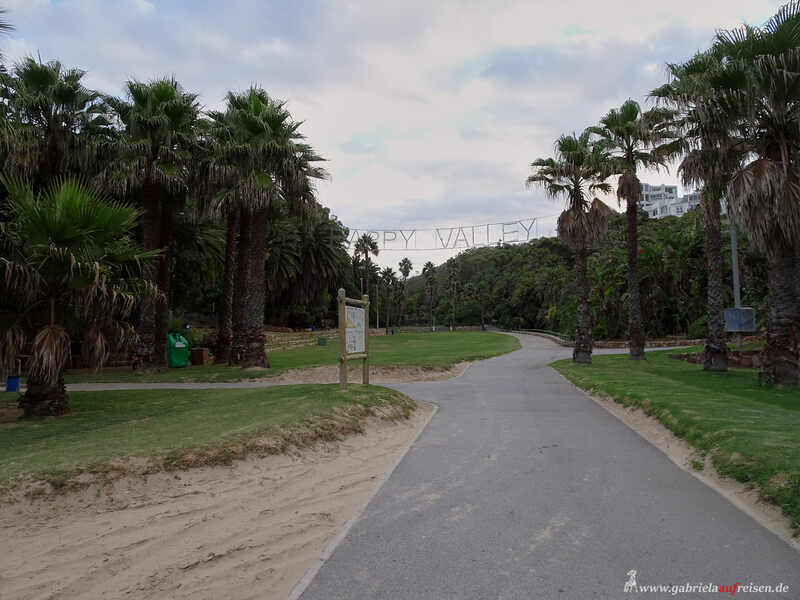 The beach is deserted, as is the Happy Valley, a green garden in the middle of the city. 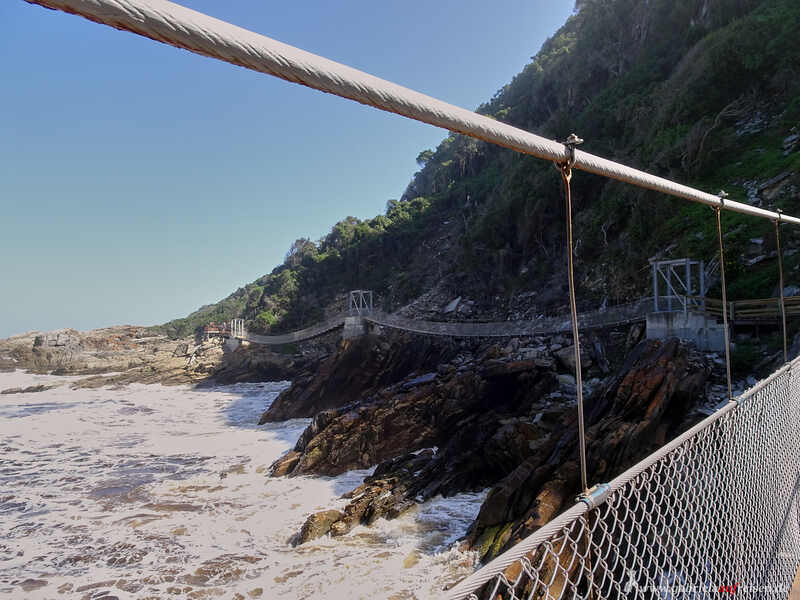 After a 2 hours drive we reach Storms River Bridge, which spans the gorge of Storms River. Very convenient, that a rest stop is right next to it and we can use the break also for taking pictures. 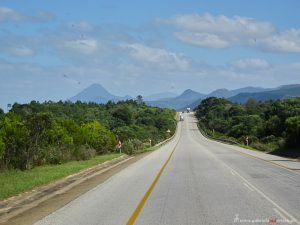 This is where the Garden Route really starts, the landscape is absolutely beautiful. 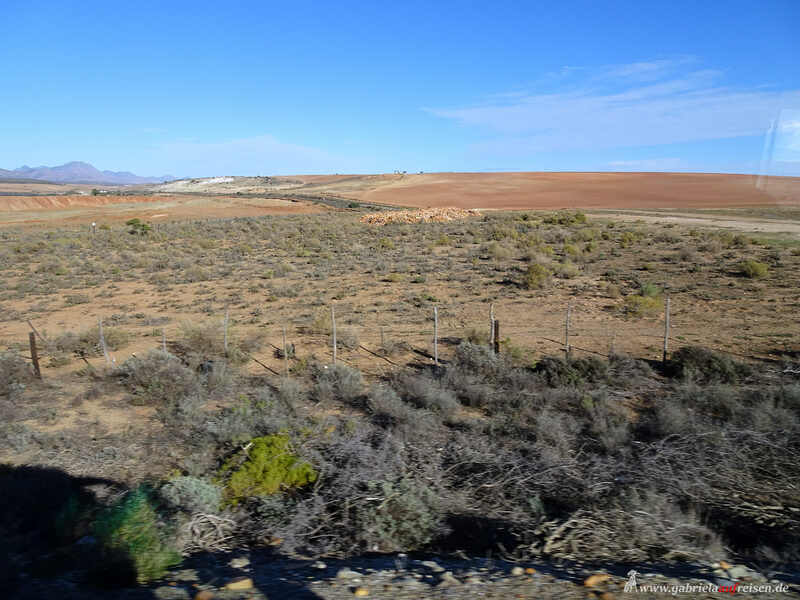 No wonder the Boers who came here first, thought of it as a kind of garden Eden. Unfortunately, the current landscape is not very similar to the landscape of the time, but it is still beautiful to look at. After a very short drive with the bus, we reach the entrance to the “Big Tree”. 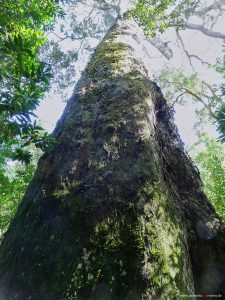 After 600 m on a well maintained wood path we reach the approximately 350 year old yellow tree, which has about 9 m circumference. 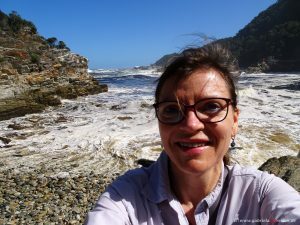 Then on to Tsitsikamma National Park, a marine reserve. Wow! The first view and also 2 hours later we are totally impressed by this natural spectacle and the environment here. Some people camp here or rent small wooden cottages. Meter-high crushers thunder here with elemental force on the heavily rugged coast, there is a loud roaring in the air. I feel like I could almost grab the damp air. 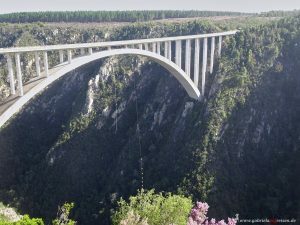 Who is reasonably well on foot, goes over the Mouth Trail, a wooden path, to the suspension bridges. There are many steps to climb, but again and again I am rewarded with a breathtaking view of the coast and the bubbling sea. Then I stand at the first bridge that spans the Storms River at its mouth into the sea. As I go over, I see kayakers kayaking up the river. It flows calmly and is quite brown from the sediments. The bridge rocks quite well, but that does not bother me. The untamed nature impresses me much more here. On one side the mountains, which are covered with a jungle, into which the river has cut in a deep notch, on the other side the roaring, turbulent sea. Just beautiful! Over further suspension bridges, the circular route winds back to the parking lot. Unfortunately, we must continue, because we want to arrive in Knysna in time for the sunset. The Protea Hotel Knysna is located directly on the small harbor with a lot of restaurants and small shops offering many typical handicrafts. The sun is setting over the harbor and we are lucky to get a table in the restaurant “Dry Dock”. The food is good and plenty. 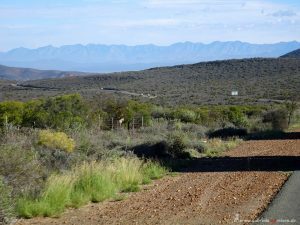 The next morning we leave early for Oudtshoorn. 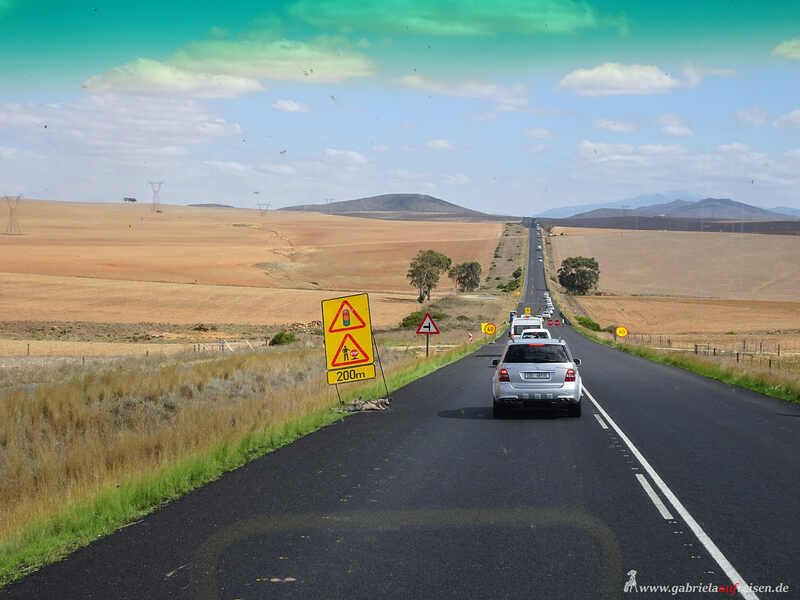 First we drive through a green hilly landscape. Unfortunately, a devastating fire ravaged here last year that not only devastated the forests and left empty, charred tree trunks behind, but also burned many houses to the foundation walls that were standing here. The bushes and grasses have already recovered, but it will probably take many years for the trees to regrow. Since we hang behind slow-moving trucks for a while, the journey takes longer than the planned 2 hours. We drive through the nice coastal towns of Wilderness. and George, before the landscape becomes drier and more monotonous. The earth is red and stony, less and shaggy vegetation grows here. 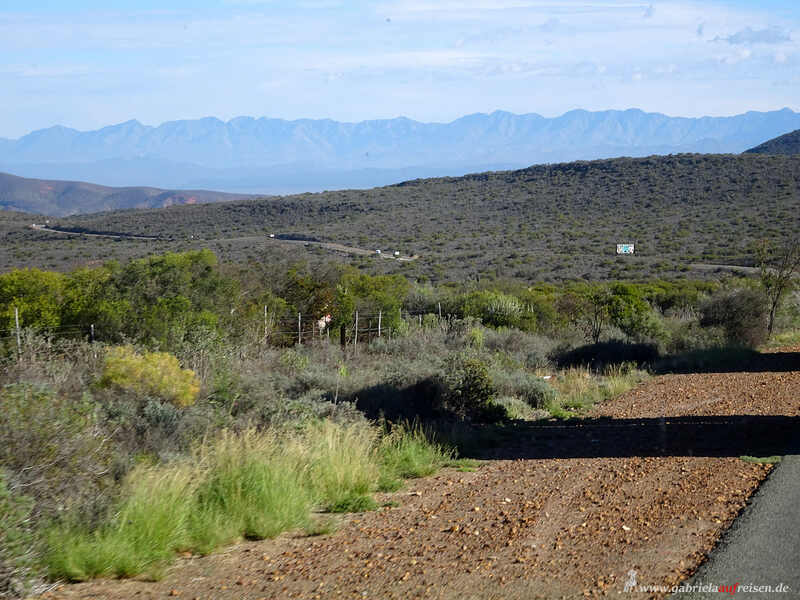 We come to the Little Karoo. lies in front of us. 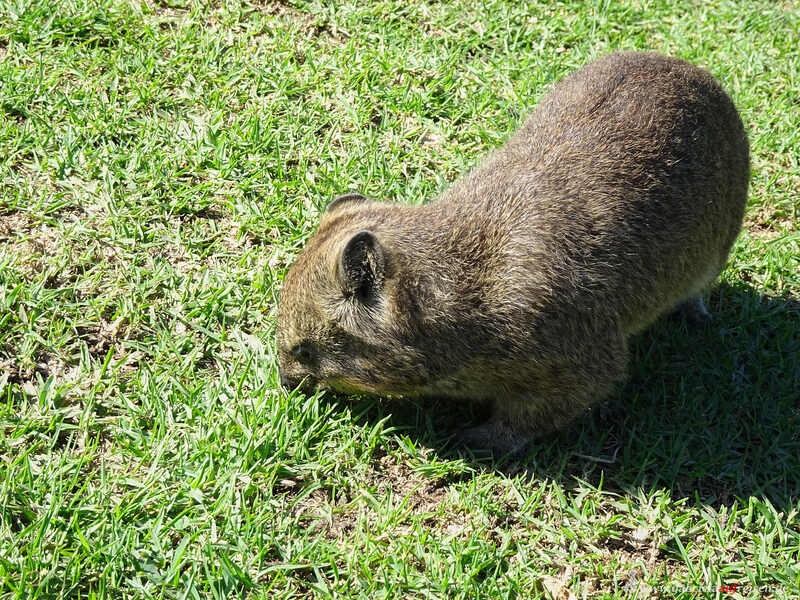 We hear from Gisela that you can stay here at game lodges and at sunrise you can visit meerkats with a ranger. But first we want to visit the Cango Caves. 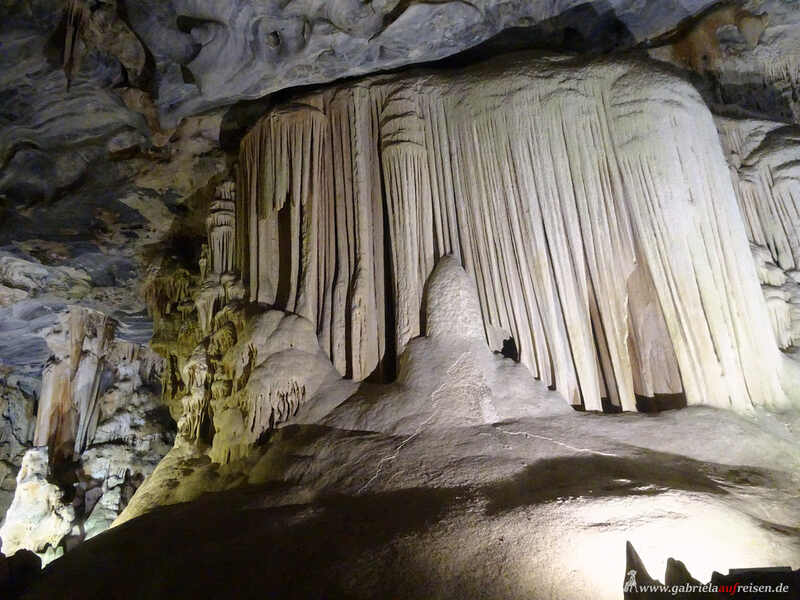 This is a kilometer-long stalactite cave system, a small part of which is open to the public. A special feature of this cave is that there is a temperature of 19 degrees Celsius in every season, as it is only a maximum of 25 meters below the rock. So always enjoyable. A German speaking female ranger leads us through the cave, which boasts huge halls. The stalactites and stalagmites are many hundreds of thousands of years old, as they grow extremely slowly. 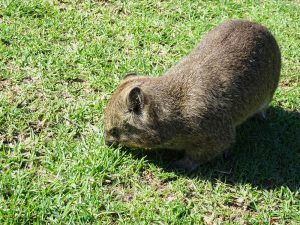 Even the local aboriginals, the San, inhabited the foremost part of the cave. The ranger introduces the fantastic acoustics with a goosebump version of the “Ave Maria”. Still very enthusiastic we drive back about 30 minutes to visit one of the many ostrich farms here. 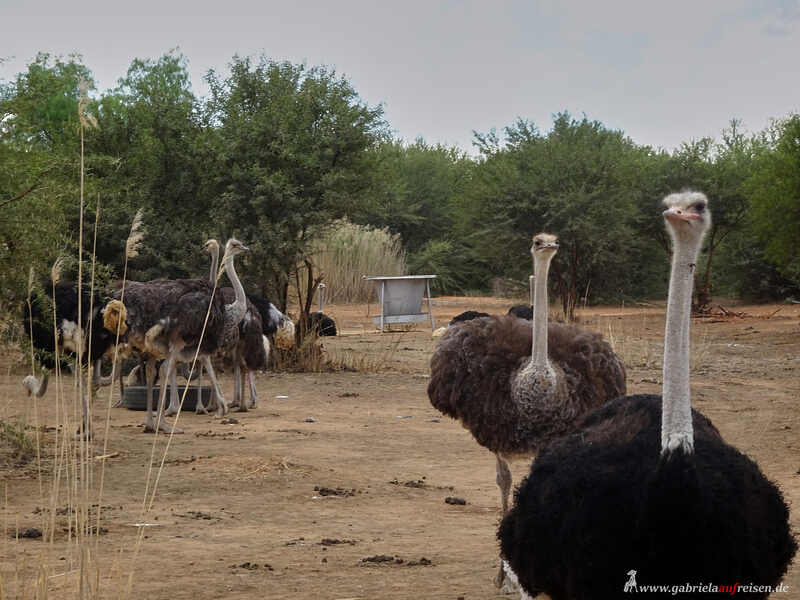 In the “Ostrich Safari” farm, we first get a really delicious 3 course meal. Who guessed it? Of course with an ostrich steak and ostrich sausage. Then we get a guided tour of the farm, where we get to see the different ostrich species and learn a lot about the attitude of the animals. Previously, they were only kept for the feathers, today because of the extremely low cholesterol meat. Then we drive back to Knysna, towards the sunset, which dips the landscape in a wonderfully soft light. The next day we need to drive the almost 500 km to Cape Town. We have already seen most of the Garden Route, which leads from Storms River to Mossel Bay. 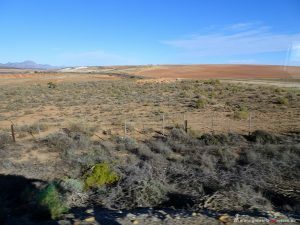 The landscape changes now, but is very varied, huge harvested fields are repeatedly broken by forests or hills. The roads are pretty empty, so we are making good progress. 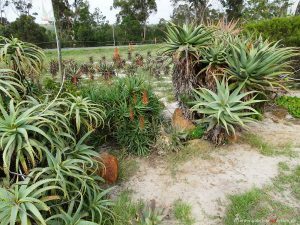 On the way we stop at an aloe production. 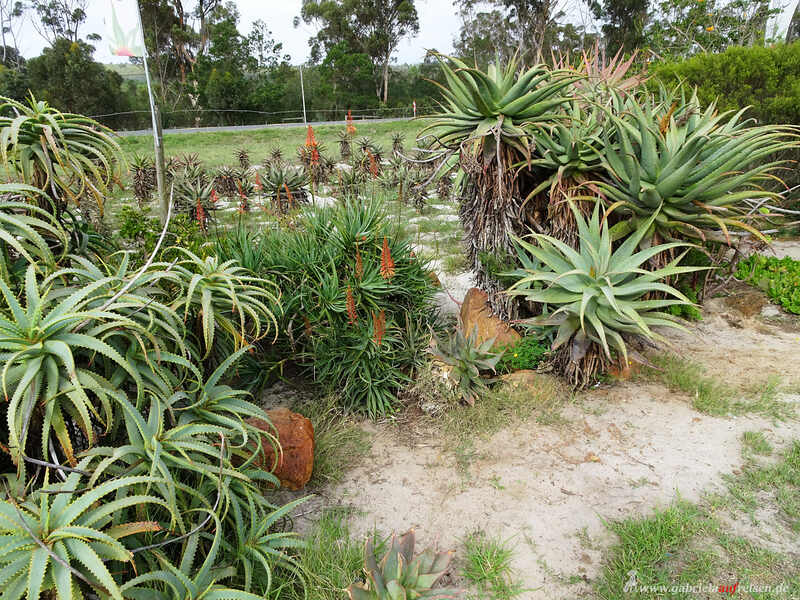 This plant is said to have many healing properties, which is partly proven. Towards evening we finally arrive in the city at Table Mountain.It shows us even without its cloth, the clouds that so often waft down it. More from Cape Town then in the next blog post. More pictures and updates are available on Instagram, Facebook, Pinterest and Vero (Gabriela Kern). I am always happy about “likes” and comments! Of course there are more pictures on my German blog.